I have to confess I got an awful shock when Inspector Parker made his brief appearance in this book — it’s no longer Gabriel Woolf! I knew it was coming, but gah, I hate the transition every time. And it doesn’t really help that this might be my least favourite of the mysteries: in the original book, it relies on suppressing information that, in the end, wouldn’t actually help the uninformed reader that much. At least that doesn’t happen in this version, but it’s also a murder mystery worked to a very specific timetable, and on a second, third or fourth reading it gets a little tedious. To me, anyway. 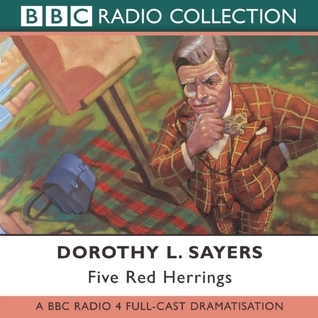 I’m sure there’s someone for whom Five Red Herrings is their favourite. Of course, the attraction in Sayers’ clever dialogue and Ian Carmichael’s perfect delivery remains, and with some crochet to occupy my hands, it’s still a pleasant interlude.